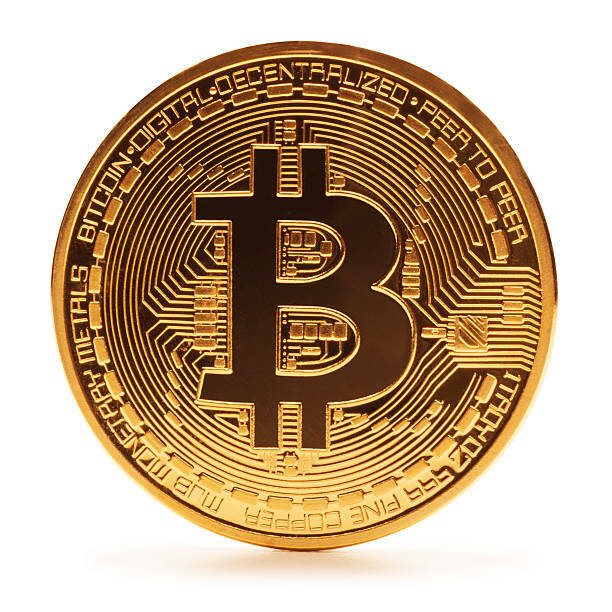 Bitcoin and the law - find out legal implications of Bitcoin! A photograph of a souvenir coin that was made to represent Bitcoin. In actual fact, Bitcoin is fully digital, and there has been no central issuing body for such metal coins, but increasing number of Bitcoin fans tend to buy these metal coins as souvenirs or gifts. Ironically, Bitcoin needs no introduction. It’s in the news so often nowadays that we are already aware of what it is. The price of Bitcoin has been skyrocketing, and last weekend it touched $17,000 before coming down to around $15,000. The strange thing about Bitcoin is that it is an invention without an inventor. Shortly after the subprime crisis in America, and the ensuing global financial meltdown, the world began to look for alternative financial systems. In that crisis, around 2008, a white paper floated into the public’s consciousness describing what could be the solution that the world was looking for. A screenshot of the first page of Satoshi Nakamoto’s white paper on Bitcoin. It was the white paper that introduced Bitcoin to the world. 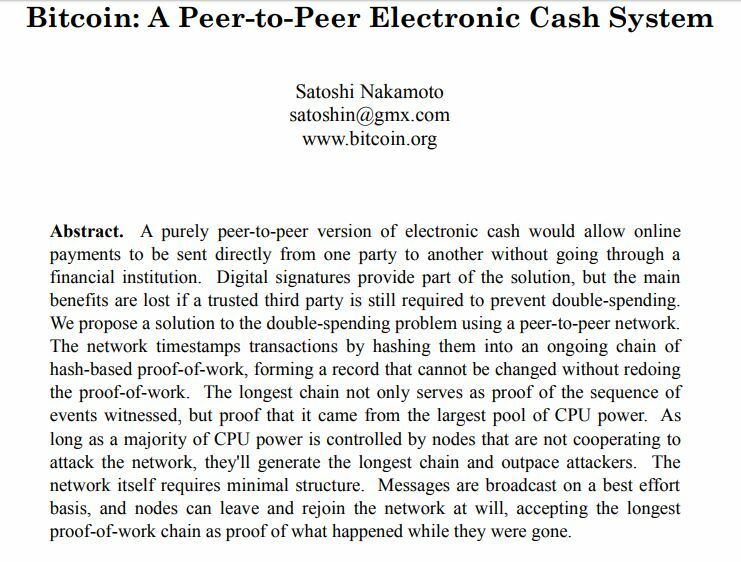 The paper was authored by a pseudonymous programmer, Satoshi Nakamoto, describing his invention which he called “Bitcoin”. By 2009, Satoshi unveiled a working prototype of his Bitcoin code. It was a revolutionary technology which solved the problem of trust of transacting among strangers without a trusted middleman. But then again, it was a response to the problems caused by the existing financial systems — the system created by banks, who act as intermediaries. Banks vouch for the system, and make monetary policy, including monetary supply, and interest rates. The old system worked through the trust embedded in banks. The new system proposed by Satoshi Nakamoto did not require any intermediaries. Bitcoin had arrived on the scene, and with it came the trustless economy. It solved a very important mathematical problem that had puzzled scientists for ages: The Byzantine Generals problem. By relying on a majority of nodes connected to a peer-to-peer system, and using cryptographic hashes, it could ensure that the cryptographic proofs are able to prove the transactions that had taken place. 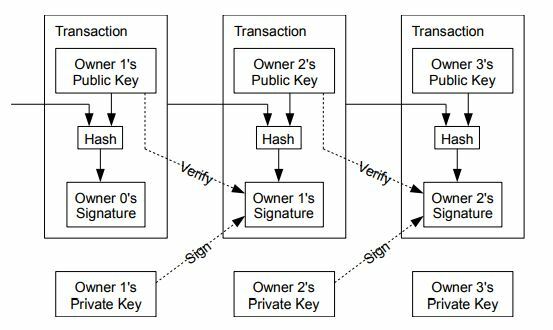 An explanation of how cryptographic hashes work in the Bitcoin Blockchain. This is central to the safety and integrity of the Blockchain, which extends to the very first transaction called the “Genesis Block”. Recent transactions are summarized and compiled into a block. Every ten minutes, a new block is compiled, and added to the records. This is the “blockchain” that we hear so much about today. Bitcoin became more and more famous. Interest began to pick up around Bitcoin. Today, Bitcoin is considered a digital currency. It can be a medium of payment, in digital form. About a hundred years ago, A wanted to buy a house from B using gold. B agreed, because gold is rare and precious. In order to buy B’s house, A must have the gold physically. In this transaction, gold is considered as a medium of payment. In today’s world, people have started using Bitcoin as a medium of payment. Today, A can buy B’s house using Bitcoin, as long as B is agreeable to the proposal. There’s only one catch, or two (depending on how you see things). For A, in order to get Bitcoin, he would need to exchange his traditional money (AKA fiat currency) into digital form and use it as a medium of payment. He would probably need to find some way to get Bitcoin. That’s the first problem — converting cash into Bitcoin. But once he has Bitcoin, it is transferable, using his computer or a smartphone without any third party involvement. All the transactions in Bitcoin are recorded in a public ledger (Blockchain) which people can access and verify. The system is secure and relies on computers which keep a replica of the blockchain, even as it continues to be updated. After the transaction, a second problem emerges: B has to find a way to use the Bitcoin that A paid to him. Perhaps that would not be a problem, given that the price of Bitcoin is skyrocketing today. B may like to hold on to it, as it increases in value. But B may have to convert Bitcoin to cash one day, if only to use it to pay for things in the real world. The Blockchain can be described as a public ledger, like a notebook, which records all the transactions in the Bitcoin world. Whenever someone sends Bitcoin to someone else, it would get updated in the Blockchain, i.e. the massive public ledger. You can imagine a public ledger like the National Registration Department, which records births, marriages and deaths. The information is there for anyone to examine. But the Bitcoin Blockchain records movement of Bitcoins, from one address to another. Every computer connected to the network first downloads a complete copy of the Bitcoin Blockchain. It’s as though you have a room of account clerks, and the first thing that a new account clerk does is make a copy of all the previous pages, until he or she is up to date. The difference between the account clerks and the Blockchain is that every computer on the network has an exact copy of what the others are having. Your account clerks would be redundant if they all recorded the same thing; who would pay them for that? Yet the Blockchain is intentionally redundant, so that it provides security to the network by having backups. By having thousands, if not millions, of copies in the network, all of which are updated in real time, the Blockchain becomes resistant to tampering. In a Bitcoin transaction, one user sends the Bitcoin, while the other user receives it. Both must have Bitcoin addresses, which are called “wallets”. Every wallet has two keys: a public key, which is necessary for others to send money to the address, and a private key, which is necessary for the wallet owner to withdraw Bitcoin. The nonce is a number that helps to tie the cryptographic hash of the previous block to the present block. It’s a very important part of the Blockchain technology. It may be noted that transactions on the Blockchain are public, and transparent, but no real names are supplied on the Blockchain. Many imagine that this gives them total anonymity on the Blockchain, but this is not the case. In fact, repeated usage of Blockchain addresses to receive and send money can yield information on the holder of the wallet. This is what happened in the case of an online black market called The Silk Road, in which the authorities managed to bust an illegal drug trade market through observation of Blockchain addresses over a period of time. They managed to link the addresses to real life persons, and that became evidence in the court. 2 January 2014 stating that Bitcoin is not legal tender. However, it is expected that Bank Negara Malaysia will be issuing new rules and regulations in 2018 to regulate cryptocurrencies. If Bank Negara does not issue any regulations, it does not mean that Bitcoin is not regulated. In fact, all existing laws can and probably will be applied to cryptocurrencies, including laws on securities, financial services, contracts, and the like. Due to the nature of the Blockchain, one of the issues is double spend: If you happen to have received Bitcoins, but the transaction was not recorded in the Blockchain due to a “double spend attack”, you in fact do not receive the Bitcoins at the end of the day. There will be no help desk, and no customer support service, to turn back the clock. If you have given away something precious (e.g. some digital art) in exchange for Bitcoins that do not turn up, what is your legal recourse? Relevant laws might include contract laws, which might take the form of Terms of Service on an online marketplace. Another issue might be dealing with questionable parties, which should give rise to KYC / AML (know your customer / anti money laundering) considerations. The financial institutions of most countries are required to identify and verify the identity of the customer, to avoid fraud, money laundering, and even funding of terrorism. This may not be possible in the cryptocurrency world, or online marketplaces, in which any person can open an account and start trading. Yet a third issue may be in the sale or purchase of Bitcoin, in which Bitcoins are exchanged for real life money (fiat currency). Bank Negara Malaysia has made an announcement that all parties that provide services of changing Bitcoin into fiat currency are automatically classified as reporting institutions. This means that details of transactions, volume, and such, must be provided and reported to the central bank. This might not be an issue for crypto exchanges which do not offer services of buying Bitcoin with real money, but only allow their customers to trade Bitcoin for other types of cryptocurrencies. However, it might affect crypto exchanges which allow customers to purchase Bitcoin using their credit cards. The rapid day-to-day increase in the price of Bitcoin, and generally its wild price swings, may mean that traders should peg their transactions based on fiat currency, rather than Bitcoin. When a transaction has been agreed upon, with the consideration made out in Bitcoin, the overnight appreciation of the price of Bitcoin may lead the purchaser (who pays in Bitcoin) to want to renege on the agreement, while the opposite would be true of the vendor. In such a case, the construction of the contract may be a fundamental issue, and it may be best to get the services of a lawyer from the start. A final issue might be the security of the Bitcoins which are stored on online wallets. There are many types of Bitcoin wallets, and the safest type is probably the offline wallets. (Try looking online at hardware wallets or paper wallets). When you use the services of an online wallet provider, the private key to the wallet are held by the service provider. This means that the service provider can withdraw your Bitcoins, if she or he is unethical. The irony is that many people use online wallets without knowing who the provider is. There was a company called Mt Gox, which was the biggest downfall of this sort. In 2014, the management of Mt Gox announced that 850,000 Bitcoins had gone missing. So, while the Blockchain is infallible, and immutable, human nature is not. If you put your trust into the provider of an unscrupulous online wallet, you could stand to lose your Bitcoins. The Mt Gox case could be worth examining if you are concerned about the dangers of online wallets. This article was co-authored by Nurul Atiqah, and Kevin Koo, lawyers at Koo Chin Nam & Co.